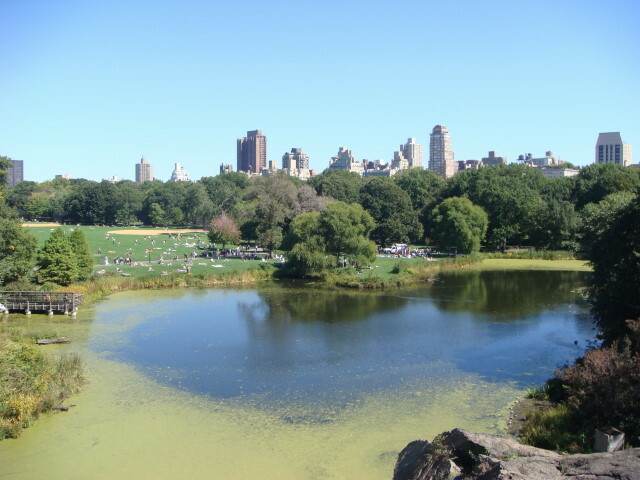 Whatever else it may be, Central Park is diverse and varied and just all over the place in terms of what’s there and what you can see at any one time. When it was designed by Frederick Law Olmsted and Calvert Vaux , they seem to take to the idea of it being impossible to see in one fell swoop. There are areas that you can see a lot of the Park, but no place that you can see the whole. 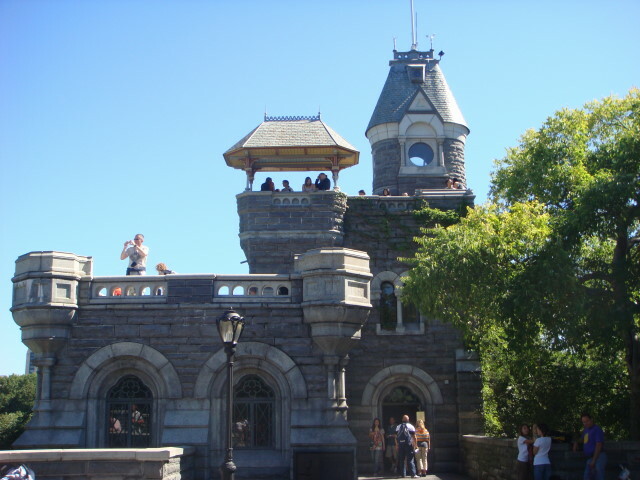 About the best you can do is go to Belvedere Castle and get an elevated view. There are a number of ways to get there, but the primary means I’ve always done is by wandering through The Ramble and it kind of ends up there. But, for me, the Ramble is something I do when I really want to do some twisty, curvey, wooded walking. It’s really nice and I usually view Belvedere as my “reward” for having done the walk. Once you get there, you can go up and take in that semi-aerial view. The body of water is called Turtle Lake and this time it was pretty well covered with some sort of pond scum. I think it’s “duckweed”, but that’s a guess on my part. Few ducks, but quite a few turtles. The area in the distance is one of the many lawn areas that dot the Park. Some are much grander (the Great Lawn and Sheep’s Meadow are two famous and wonderful ones). The inside of Belvedere is a Park exhibit on the ecology of the area. Mostly, though, what people do is go up this tiny circular stone stairway to the top to get the best view. I don’t think I’ve ever done it without running into someone coming the other way and one of us has to back out ’cause it’s too small for two. One of my more odd pleasures in doing the Ramble walk is seeing what’s right next to Belvedere Castle. It takes a few pictures to capture it all, but I’m used to putting up too many pictures. 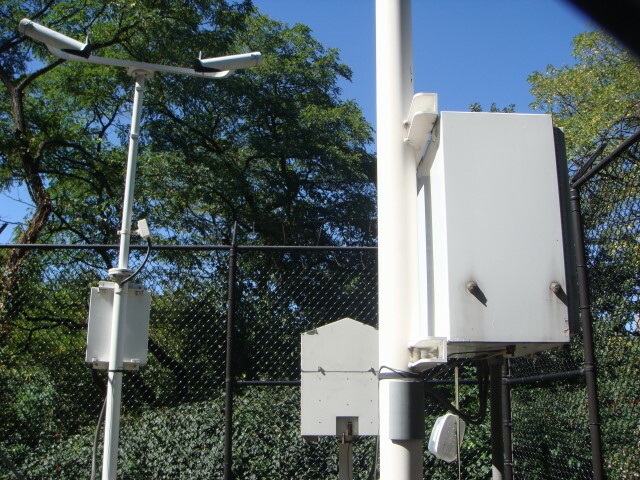 It’s the official Central Park weather station. I always get a kick out of it thinking it’s the source of all the “current weather” reports on NYC. 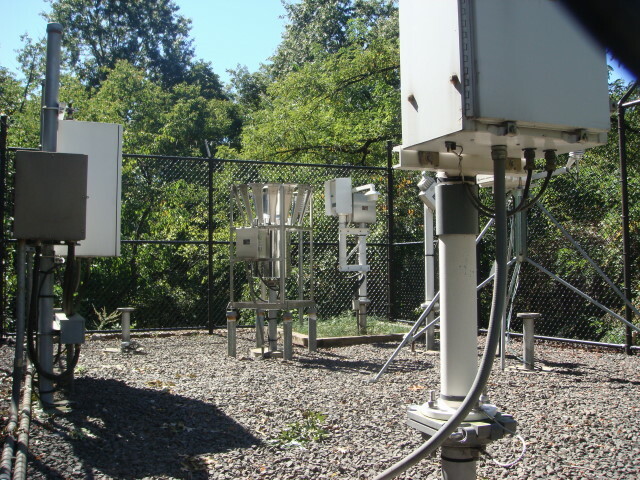 There are no signs and I’ve never seen anyone in there, but it’s definitely a weather station…or an alien communications station…nah, it’s a weather station. It’s completely enclosed in a secure fenced-in area but I have my secrets for getting fence-free pictures. As much as I wander the streets of NYC and as much as I think I know the City…I know almost nothing. 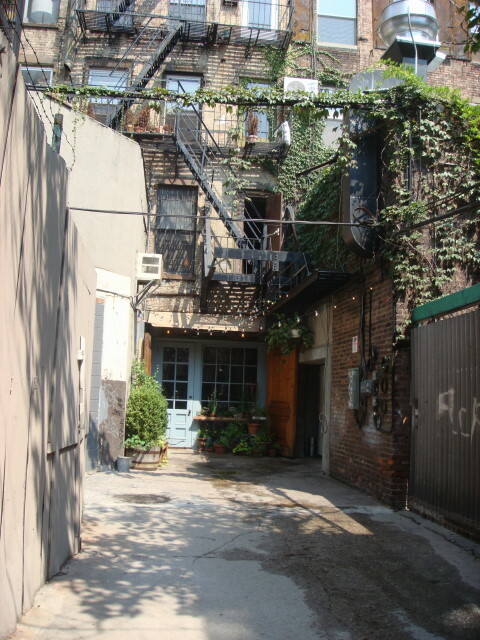 Here’s a place just off Rivington Street in the Lower East Side (LES). Whattaya think of it? There’s not even a sign. 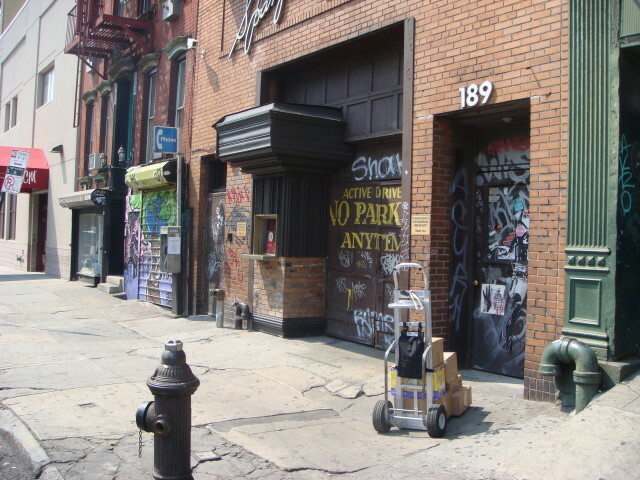 I’m not sure which door the the real entrance (the address is 189 Chrystie Street so I presume it is the far door). 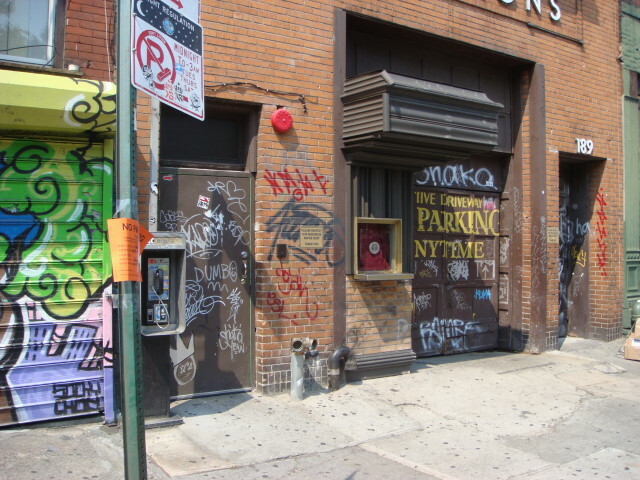 It’s “The Box”, a NYC hot-spot club that I walked by a bunch of times and kind of tut-tutted over the grafitti. I had no idea. It’s got a somewhat interesting website at www.theboxnyc.com that describes the place as a place for “fine dining and theater”. But this really isn’t telling you anything about it. I first heard about the place when I was at a juggling store called Dube (a future post, I imagine). I do some juggling and was looking for some juggling balls for a little cousin. I ran into a character whom I thought was an employee, but it turned out to be a performer by the name of Flambeaux (note that some of his site has stuff that is…not G-rated) who works with fire as part of his show. We got into a short but terrific conversation and he described working at The Box and how it looks terrible on the outside and magnificent on the inside. I haven’t been inside, but his word on the outside is correct. The back of this place was on my previous posting on Freeman Alley. Someday I’m gonna go in and see how it looks. Of course, this is the sort of place that tends to keep my uncool sort out. Not a real problem. I just think of all the places that look like this when I wander the streets and wonder what they are like inside. You never know. 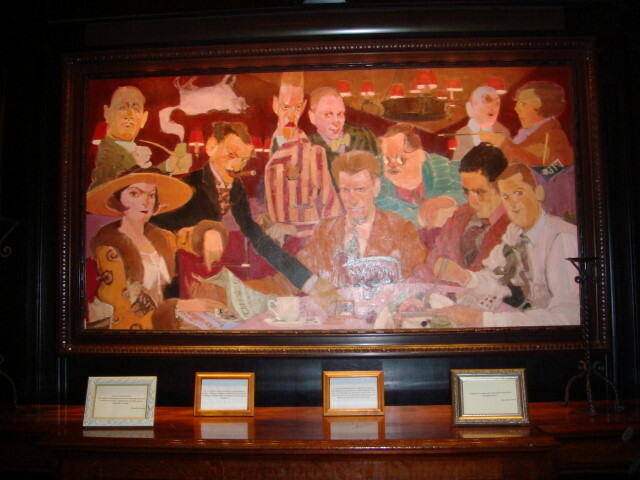 As odd as it may seem, one of the great desires I had when I first moved to NYC was to see the Algonquin round table. It took me a month or two, but I did it and I still ankle over there on occasion to check in on it. My version of a thrill. And it always astonishing me that no one seems to know what it is. 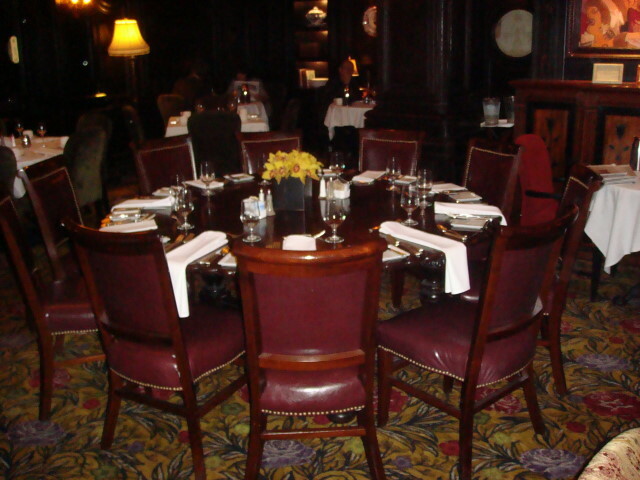 What it is….is a round table in the Algonquin Hotel located on W. 44th Street between 5th and 6th Avenues. And the round table itself. It’s got ten seats around it now, but my memory of its reference was that there were actually eight seats in the heyday of the 20’s. Wikipedia has a nice entry on the table with all of the key players identified. I first remember learning about it when I read Harpo Marx’s autobiography “Harpo Speaks”, which is a great read. The table was where NYC’s intellectual glitterati of the 20’s would gather each day to one-up each other with witticisms and cut-throat insults. The most famous of the participants were Dorothy Parker, George S. Kaufman, and Robert Benchley. There were lots of hangers-on (like Harpo), but the gist of the table was a celebration of how smart and popular these characters were. Harpo was apparently a good friend of Alexander Woolcott (a key member of the “real” group) and I’m sad to say he’s one of only two characters in the core group that Wikipedia doesn’t have an entry for. As I understand it, Woolcott was a critic and newspaper writer who had something of an edge to him. The hotel has a painting of the group next to the table. People do sit and eat at the table and I’ve always wondered if they knew that they were sitting at the center of a lot of what the “Roaring 20s” was all about. It doesn’t matter. 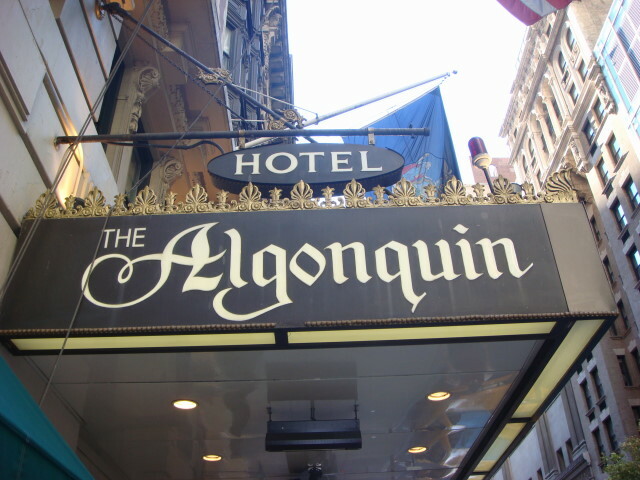 The Algonquin is still a very, very nice hotel with an active entertainment schedule such as lounge singers and the like. I haven’t eaten there (their prix fixe is about $60 and I keep telling you folks I’m cheap), but it gets good reviews. Continue straight on by and ignore the first right turn. Take the second right turn. Life is good, you’re close. 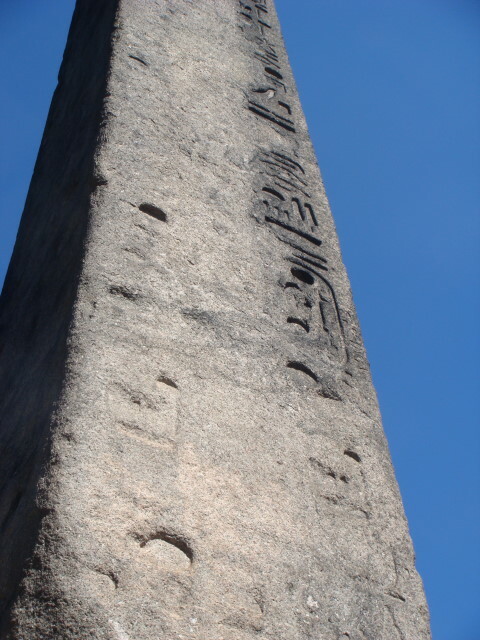 Cleopatra’s Needle is somewhere around 3,600 years old. And it looks pretty good for that kind of age. Unfortunately, New York City is aging it faster. 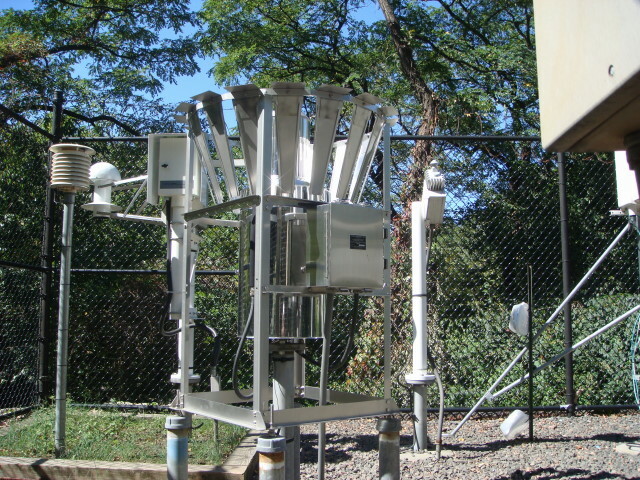 Or, rather, the pollution and the rain and the temperature changes and the….are all ganging up on it. Nevertheless, it’s a magnificent point of interest. Here’s a view from just north of it. A little closer it starts to really show both the good and the bad. As you can see, one side’s in pretty good shape and the other is very weathered. With a slightly different view, the weathering is very evident. Okay, that’s enough of the negatives. 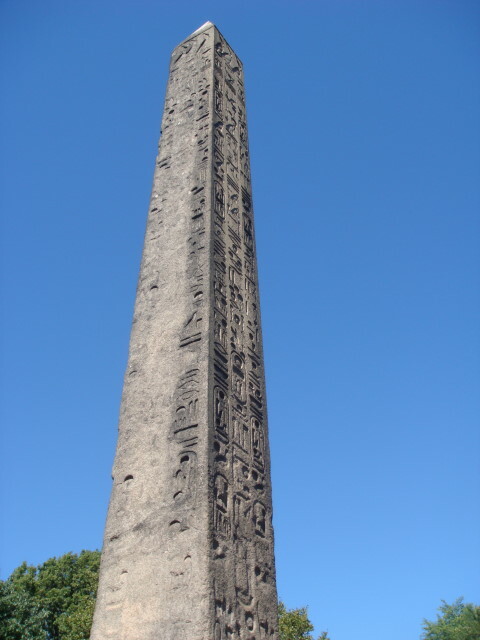 I love this obelisk. 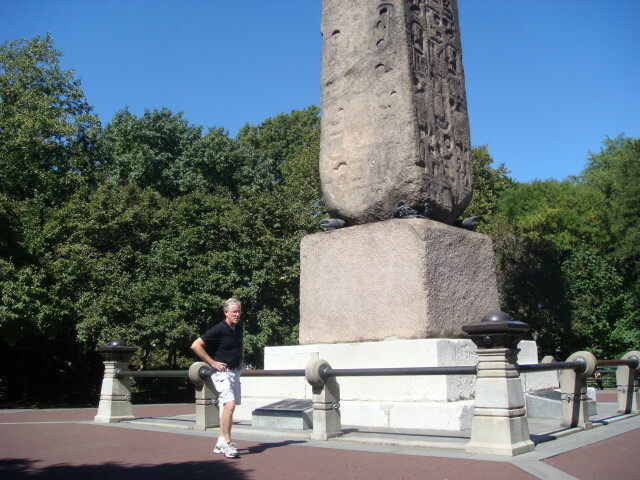 It is very historic and the history of it being constructed thousands of years ago, being moved to Alexandria a thousand or more years later, and then to New York another couple of thousand years after that is just mind boggling. I love to sit and stare at it and think about the original makers and how they couldn’t have begun to conceive their handiwork’s fate. And, no matter how crowded Central Park is, there are few people here. When I showed up on Sunday, there were about 10 people milling around, more than I’ve ever seen there. But within two minutes they had wandered off, leaving just three of us. A few minutes later a couple of others showed up. Here’s a shot for scale. You can notice a couple of things about the base from this. First, at each corner near the ground is a plaque with a translation of the markings; sometimes with blanks where the archeologists couldn’t read it due to weathering. Second, at the point of the actual obelisk meeting the new base, there are “crabs” holding the obelisk steady. These crabs are modern, but are based on the stone ones in the Metropolitan Museum just across the way. One at each corner holds the obelisk upright. 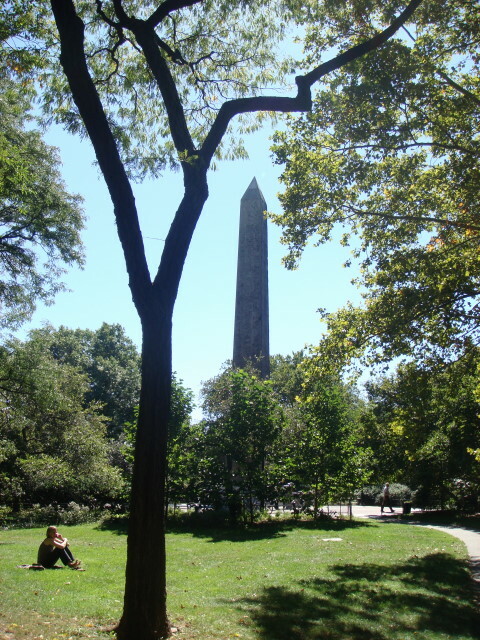 If you like history, and I do, the sight of Cleopatra’s Needle is quite inspiring and impressive. If you want to know more about it, I’d suggest the Wikipedia article. 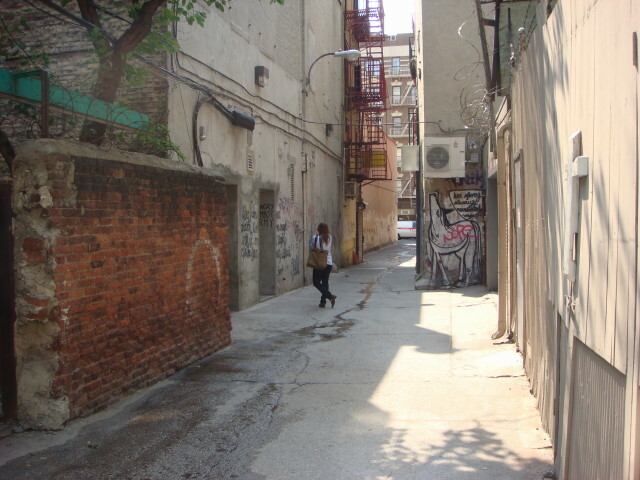 A while ago, someone pointed out “Freeman Alley”, a tiny little alley just off Rivington Street. I haven’t thought about it in quite a while. 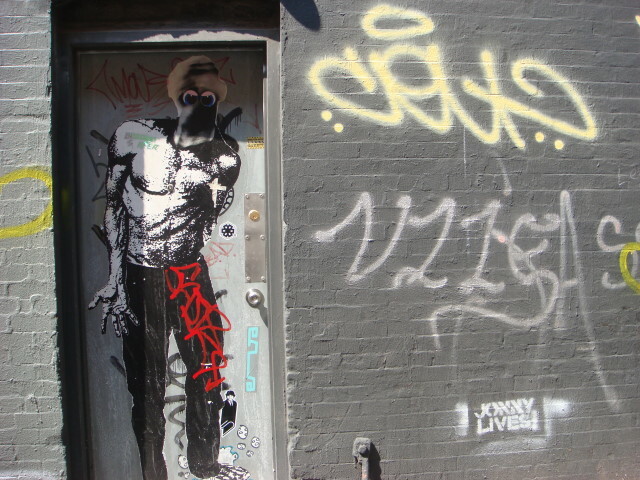 T’other day, I was wandering around and about LES and saw it, and spent about 90 seconds wandering the length and width and breadth of the alley-way. 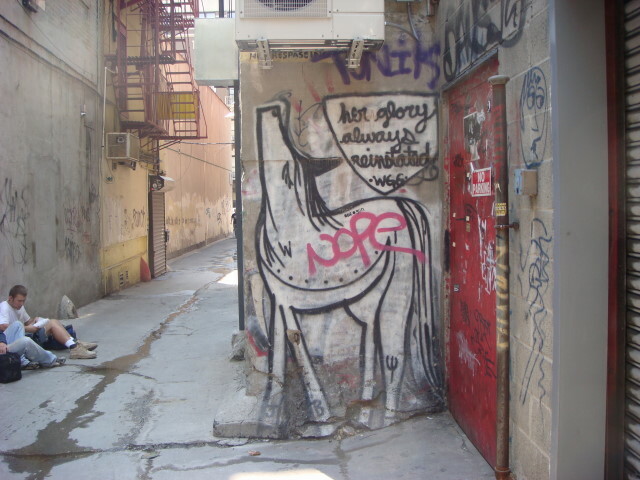 Let’s see if I can get an actual posting of nothing but an alley. There’s not much to it. Here’s a picture that pretty much covers the whole length. It’s got a couple of restaurants and stores back here, all apparently hot-spots of some sort. I can say it has some terrific graffiti. I’m glad Jonny’s doing okay…okay, that he’s at least alive. 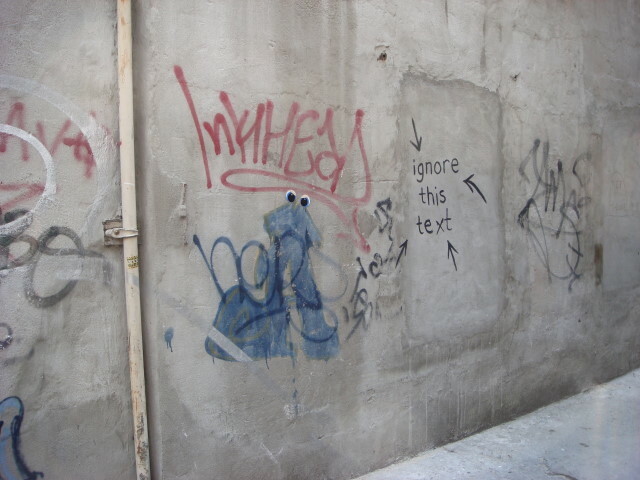 I would have ignored it, but it kept my attention. Apart from the LES grittiness, there is at least one straight-out nice looking place. I believe it’s a restaurant. Okay, not much of a post, but it leads to another small post I’ll do in a couple of days. In that last shot, just to the right is the back of a place called “The Box”. I had never heard of it until I ran into someone who was working there. I’ve become rather intrigued by it, but I doubt I’ll ever go to it. But, that’s the subject of another post. This is just a simple post about a nice little church building that I’ve walked by many times, but only recently noticed. 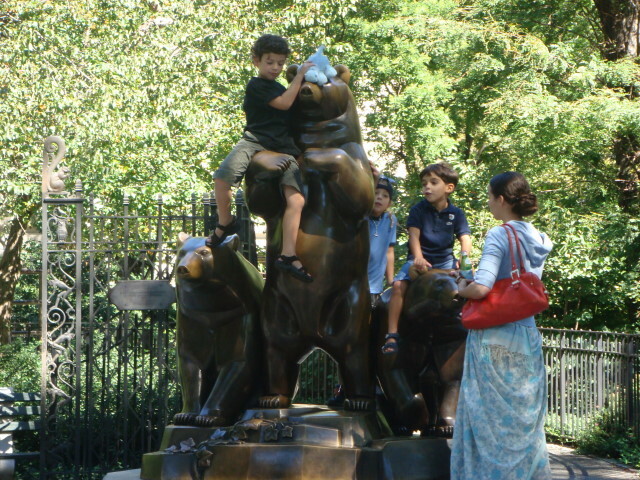 This picture is from somewhere around 5th Avenue and 26th Street in the middle of Manhattan. When I originally took the picture, I was thinking in terms of a post commenting on the Empire State Building and how it really doesn’t capture the hearts of New Yorkers. It’s not a bad building, but it isn’t one that you admire in the way that the Chrysler Building is admired. 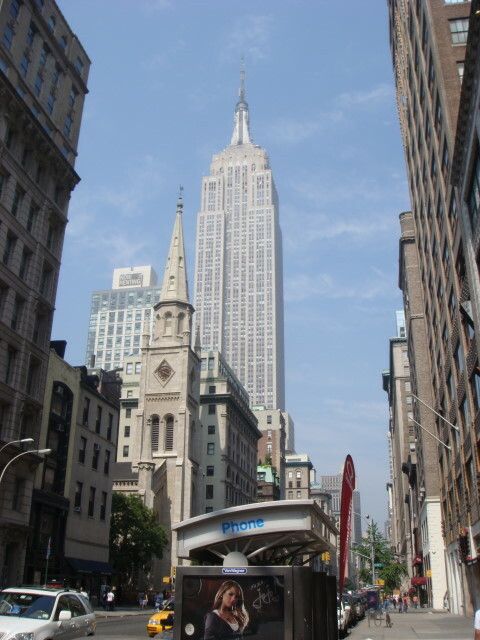 The picture above captures some of the plainness of the Empire State Building. It isn’t an ugly building by any stretch, but it is only notable because it’s the tallest building in the city…now. Anyway, the nice church in front of it does capture the difference between big and beautiful. That was how I was thinking of characterizing it. It’s not a deep thought by any means, but this blog is all about introducing and presenting NYC (I’ve had several tourists point at the Chrysler Building and ask if that was the Empire State). But the church is the subject, let’s stop my straying. 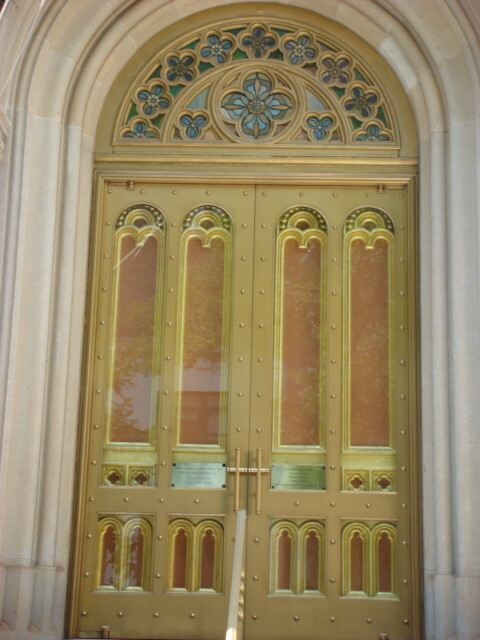 It’s formal name is the Marble Collegiate Church. It’s part of the Reformed Church of America. That’s a puzzle to me and I’m usually pretty good on that sort of stuff. Apparently is the new version (or “a” new version) of the Dutch Reformed Church. The church itself says it’s been around since 1628, making it plenty old. It’s got a great front door. On the day I walked by, the surrounding fence was covered with ribbons. 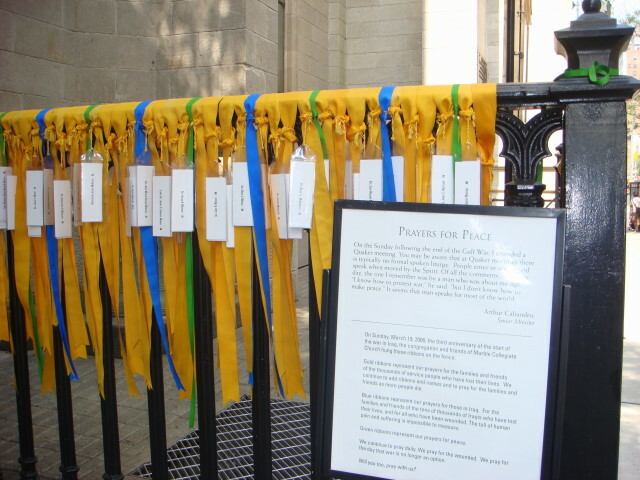 The ribbons are posted to symbolize the deaths of American soldiers (gold), prayers for the Iraqi people (blue), and prayers for peace (green). The writeup doesn’t give any indication whether the ribbons are part of a protest or simply exactly what it seems to indicate: prayers for peace and help to the grieving. And was this the reason for me doing this post? No. Nor was the relative ancientness of the church. Instead, it turns out that this is where Norman Vincent Peale spent 50 years of his ministry. He’s famous for his teaching on “the power of positive thinking”. 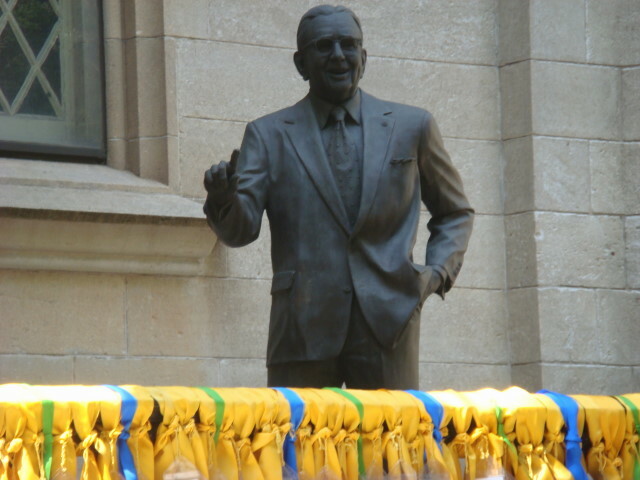 There’s a statue of him in the courtyard. Barely visible due to the ribbons. I had to climb up on a ledge to get a decent shot of the statue. And, tucked away well to Dr. Peale’s left, is another statue. 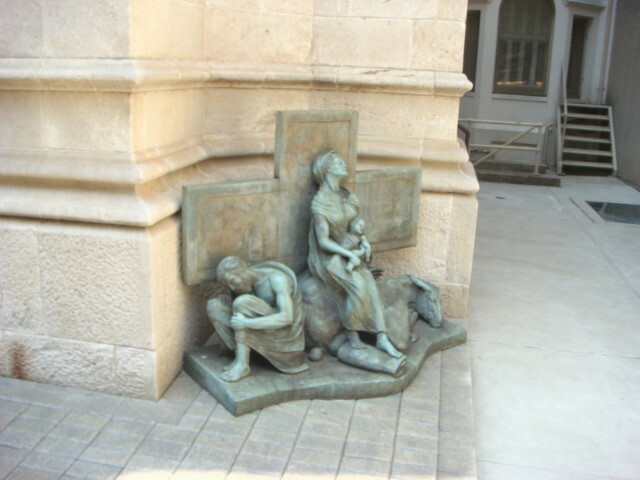 It appears to be Joseph, Mary, and Child; possibly on their flight to Egypt (Matthew 2:14). It’s small and well out of the way whereas the statue of one of the church ministers is big and front and center. Make of that what you will. Just a very quick post on the most unusual thing I’ve seen in a while. I was on the subway recently and had to change to the Shuttle to get from Times Square to Grand Central. 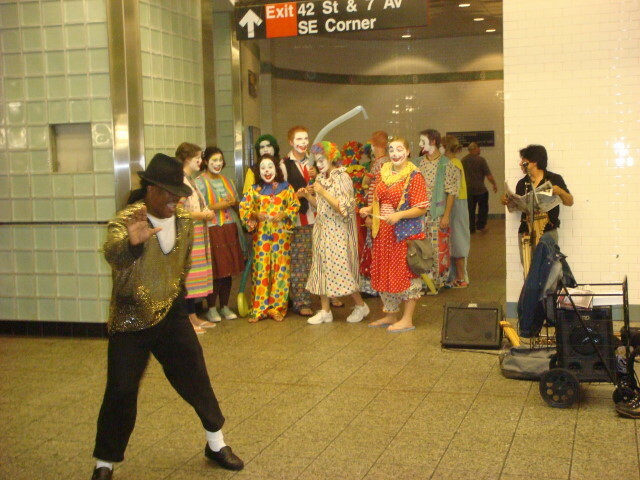 As I was going through the Times Square station, the usual spot for entertainers was in use by a Michael Jackson impersonator. I’ve seen him lots; he plays a DVD of MJ music and dances while in costume. He’s very talented and quite a showman. But…what about the group behind him? A bunch of clowns. At first I thought they had “dibs” on the space after the impersonator. I’ve never seen such a group and thought their schtick might be a bit interesting so I stuck around for a couple of songs. There was a break in the music (they passed the bucket, I gave a buck – hey, I took his picture) and the clowns just started walking around. And it looked like the impersonator was far from done. I presume he was just kidding me…but I’ve been agog with the idea that the next big fashion statement to come out of New York City is to dress like a clown. America, are you ready for it? You are currently browsing the Famous Ankles weblog archives for September 2007.